The cruise liner Manhattan was a sleek 705-foot steamship operating for the United States Line from the day of its launch at Camden, New Jersey in 1931, until it got stuck on a stand bar off the coast of Florida in 1940. The double-stacked vessel boasted twin screws and a power plant that could achieve a speed of 20 knots. She offered accommodations for 582 in cabin class, 461 in tourist class and 196 in third class. 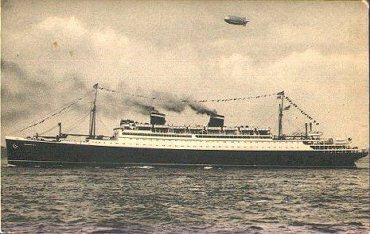 For the first eight years the Manhattan made regular trans-Atlantic trips between New York to Hamburg, Havre and Southampton. Among the highlights of that period was the day in July, 1936 when the ship left New York with the largest United States Olympic team ever assembled, including such famed athletes as Jesse Owens, Frank Wykoff and Ralph Metcalfe, on her decks. 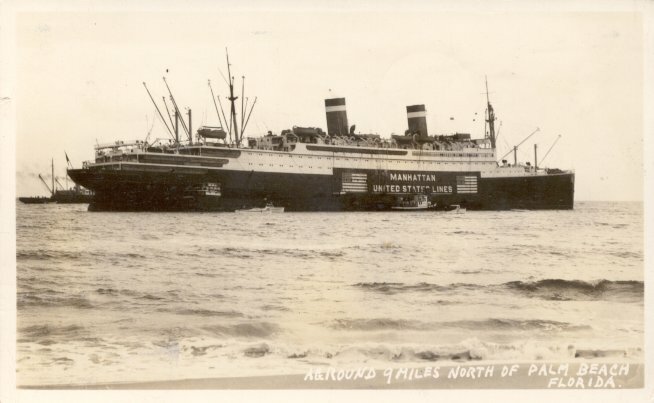 In 1939 the Manhattan was transferred briefly to the New York-Mediterranean service. In the late fall of 1940 the ship left for a trip through the Panama Canal to San Francisco, but her crew was steaming through unknown waters and got too close to the Florida coast. On December 1 she ran hard up on a sand bar off West Palm Beach, Florida, and remained stuck there for the next four months. The U.S. Coast Guard removed the 192 passengers and 492 crew members after the crew made several unsuccessful attempts to back the ship out of the mud during high tide. The Coast Guard then called the 240-foot Cutter Mojave into duty, in an effort to help tug the ship free. But rather than help in the salvage effort, the sailors found that the tides off the Florida coastline were more of a hindrence. The incoming tide pushed more sand against the ship's hull, fixing it even more firmly in place. In the end a private salvage company was awarded a contract to refloat the grounded liner. The ship had to be lightened of all of its unnecessary cargo and additional weight, including many automobiles and fuel oil, then a channel had to be dredged. After that it took three big tugs pulling in unison to wench the 24,000-ton vessel back into deep water. It was found that the liner sustained extensive damage to her propellers and starboard engine shaft. She was towed to dry dock in New York for repairs. While all this was going on, World War II broke out. Once she was seaworthy again, the U.S. Navy took possession of the Manhattan, converted it for duty as a troop transport, and changed its name to USS Wakefield. A coast guard crew was assigned to the ship. On March 9, 1942, the Wakefield was swept by a fire in the North Atlantic. The ship was abandoned at sea, but remained afloat and was later towed to Halifax. 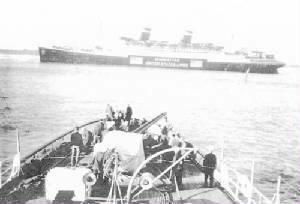 The ship was taken to Boston where it was reconditioned and put back to sea as a permanent troopship. The ship was sold for scrap in 1964.